The world of PPC ads is dynamic and constantly changes. Advertising platforms are constantly experimenting with new ways to make their ads stick out or creating new advertising products to help marketers reach their target consumers. 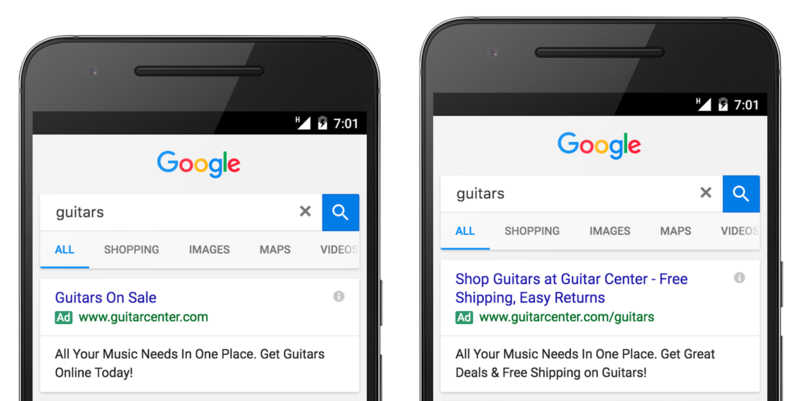 In the past few days, Google has announced the official launch of Expanded Text Ads on Google AdWords that will make the platform for effective and profitable for business owners. The first major change involves expanded text in Google AdWords. Google has been talking about using expanded text since back in May, but now the official launch is here. The changes to the format will make it possible to have more consistent ads across devices. Expanded text ads are optimized for the screen sizes of the most popular smartphones and feature two headlines, each with 30 characters, and one long 80-character description line. That’s nearly 50 percent more ad text for business owners to use to highlight their products products and services. This particular change is something that business owners and marketers need to understand and prepare for. Starting in late October of this year, business owners and marketers will only be able to use the new expanded ads. Even though the official rollout has only just begun, there is a lot of evidence from advertisers who used the product during beta testing that expanded text ads are effective. The extra characters and copy space mean that business owners can better attract their target audience before they click the ad. In order to help these new ads work for marketers, Google has compiled a list of tips and best practices for using the ad copy to reach target audiences. The “Create Effective Text Ads” guide that Google produces has been updated with ways to use the new Expanded Text ads for maximum benefit. It’s something business owners and marketers should look at to learn ways to improve their PPC ad campaigns. The introduction of Expanded Text Ads will mean changes to the interfaces for ad setup, bidding and more. Since marketers only have until Oct. 26th to get used to the changes, now is the time to experiment with new ads or trying to improve current ad sets by taking advantage of increased character limits. For more information about updates and changes at Google, read this article on recent changes to video ads on Google.